Truro City manager Steve Tully believes his side can win the Southern Premier League title following their 5-0 Boxing Day win over Bideford. Shane White gave the White Tigers the lead after eight minutes before Matt Wright tapped in a second. Cody Cooke made it 3-0 before goals from Ben Gerring and Craig Duff sealed the win to leave Truro seventh, three points behind leaders Poole Town. 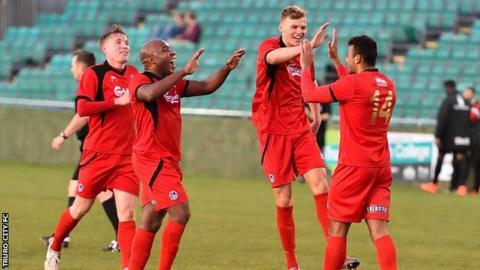 "Realistically, we can still go for the title," Tully told BBC Radio Cornwall. "I think everyone is saying we can get in the play-offs but the title is still there. Anybody in the top six or seven will beat each other, so why can't we win the title?"